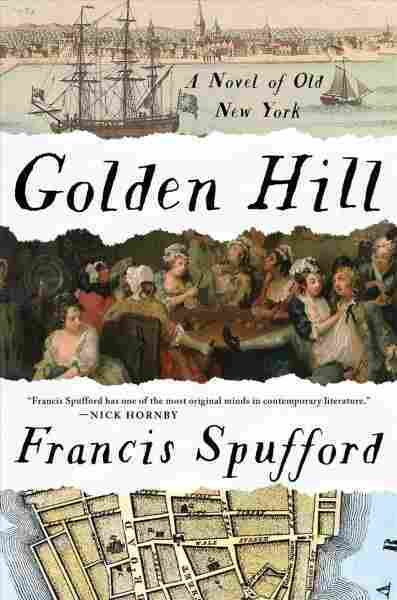 'Golden Hill' Recalls The Dark Alleys And Twisted Virtue Of 18th-Century NYC Francis Spufford's historical novel is set in 1746 Lower Manhattan, a world of spies, thieves, card sharks and crooked bankers. Critic Maureen Corrigan calls it a "gorgeously crafted" work. Ever since Peter Minuit bought Manhattan Island from the Native Americans, New York City's character has been defined by money and con artistry. So it is that classic New York stories are always populated by a grifter or two. Francis Spufford is a Brit, but he knows this cardinal rule of writing New York. His ingenious historical novel, Golden Hill (published in the U.K. last year), is set in 1746, a time when spies, thieves, card sharks and crooked bankers jostled the innocent in the teeming streets of what's now Lower Manhattan. It's a place of dark alleys and twisted virtue where Damon Runyon's Guys and Dolls characters Nicely-Nicely and Angie the Ox would've felt right at home. The opening scene of Golden Hill is also ripped out of the classic New York story handbook: On a gloomy November evening, a ship sails into the harbor and a stranger disembarks. He's a handsome young Englishman named Mr. Smith, and he quickly makes his way to a counting house on Golden Hill Street. There, he presents a bill from London investors demanding payment of 1,000 pounds. The chief merchant of the counting house is suspicious: Is Smith legit or is he a con artist presenting a forged document? In any case, the counting house doesn't have enough money at hand — this is early New York, where a hectic variety of colonial notes, along with wampum, tobacco tickets, rum by the gallon and, of course, slaves serve as money substitutes. As Smith says to himself, "It was all money, in a world without money." "This is a place where things can get out of hand very quick: and often do. You would think, talking to the habitants, that all the vices and crimes of humanity had been left behind on the other shore. ... But the truth is that [the people here] are wild, suspicious, combustible — and the devil to govern. ... In all their relations they are prompt to peer and gaze for the hidden motive, the worm in the apple, the serpent in the garden they insist their New World to be." Before his adventures end, Smith will get a personal tour of the city's taverns, theaters and debtor's prison; he'll be pressured to take part in society dinners, dances and a duel. Ultimately, the mystery of Smith's identity will turn out to be as multi-layered as that of old New York itself. Traditional historical novels are out of fashion these days; most contemporary writers who tell stories about the past prefer to tell them "slant"; that is, riddled with intrusions of skepticism and fantasy as, say, Colson Whitehead and George Saunders both do in their latest superb novels. Even Spufford himself has fiddled around with trickier techniques of writing about the past: His book Red Plenty falls in that gray zone between novel and nonfiction. But Golden Hill is so gorgeously crafted, so intelligent and entertaining, it makes a case for the enduring vitality of the more straightforward historical novel. Spufford says he was inspired to write Golden Hill by the 18th-century picaresque novels of Henry Fielding and Laurence Sterne. Spufford's sprawling recreation here is pitch perfect, down to single sentences that can stretch exuberantly to a page, as well as a comic narrator who directly apologizes to readers when events get too bawdy or bloody. "[I]f it were in my Power, I would take this Paper on whose other Side You seem to sit now, whatever the Months and Miles between, and tear a Hole in It so cunningly, that I might fold It out into a Door in the Air, through which I could step, and at once be at Home with You." Golden Hill itself is that "Door in the Air." Give yourself a treat and step through.